DML has now re-released their very nice StuG III Early kit with a set of nickel “schurtzen” plates and styrene hangers. The rest of the kit (other than the markings, of course!) is a complete reissue of Kit No. 6320. As before, this kit provides the “early production” – e.g. welded mantelet/recoil cover vice the later “Saukopf” mantelet – version of the Ausf. G. It uses individual torsion bars and road wheel arms as well as all of the external details on the lower hull such as shocks and bump stops. Each idler wheel consists of five parts with twin brass inserts between the plastic castings. All wheels are detailed to the point of having the rubber tire manufacturer’s data readable! The brass is provided only for those bits where plastic cannot do the job, such as the aforementioned wheel rims and the air intake and exhaust grilles on the engine deck plus some non-slip gridding. All fender details are separate and go on in subassemblies. In point of fact, most of this model consists of subassemblies, which is how it gets its tremendous level of details. This also shows in the sprues, as for example the “A” wheel sprue actually consists of seven sub-sprues, so future kits can be done by gating off or ungating other sections of the master sprue to meet the need of those kits. DML seems to be getting smarter in their old age, using this technique vice tossing in 5-10 other sprues from other kits to get one part from each one. The kit comes with a high level of interior parts, including the gun, commander’s cupola assembly, floor, and the radios and stowage racks for various bits on each side of the casemate. Anyone who has done any of the other DML kits with “schurtzen” will recognize the concept of using styrene hangers and etched nickel plates, and this kit has the same options with it. There are two angled end pieces and two overlapping center sections provided for each side of the vehicle. The kit does not come with any “zimmerit” which photos show applied to vehicles just like this one, and it will disappoint more than a few modelers. It also comes with the single link “Magic Tracks” rather than two simple DS plastic runs; while not incorrect it does make construction more tedious for the modeler. Technical advice for the kit is credited to Thomas Anderson, Tom Cockle and Gary Edmundson. Six different finishing options and a targeted Cartograf are provided: Pz.Jg.Abt. 2, 12th Panzer Division, Estonia 1944 (two-color, black 221); SS Pz.Gren.Div “Das Reich”, Kursk 1943 (tricolor with no numbers); SS Pz.Gren.Div. “Totenkopf”, Kursk 1943 (two-color, white cross outlines); Pz.Abt. 103, 3rd Pz.Gren.Div, Italy 1943 (sand with battalion insignia); Pz.Abt. (Fkl) 301, 2nd Pz.Div., Normandy 1944 (tricolor, black 421); and 3./Pz.Abt. (Fkl) 302, Warsaw 1944 (tricolor “squiggle” pattern). 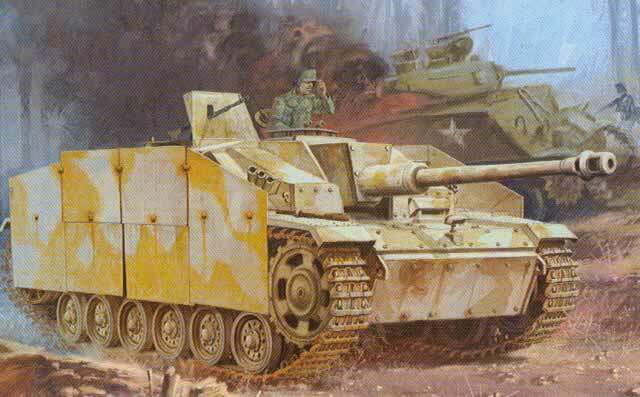 Overall, this will be popular but I personally think it is time for a “zimmerit” version of the StuG III.